The Rosh Chodesh Society is a sisterhood dedicated to inspiring and empowering Jewish women through monthly cultural learning experiences. We are proud to be part of this international study program. Classes are held once a month, around Rosh Chodesh. Each year a new topic is chosen to be studied and discussed over the course of the year. 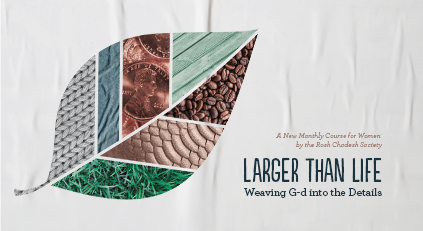 This years topic is "Larger then life-weaving G‑d into the details." For centuries, Jewish values have shaped the moral compass of Western society. This course explores and provides the students with an in-depth understanding of the key Jewish values that were so influential in molding our civilization. This course focuses on areas outside the domain of the synagogue and Jewish ritual and explore what it means to live as a Jew in “the rest of our life,” and how a Jewish woman is expected to interact with the world around her. It shines a spotlight on the Torah view of our social and ethical responsibilities. In today’s age of constant broadcasting and self-broadcasting via social media, the borders of privacy have grown befuddled. In a world where all is bared and none is barred, it is difficult to strike the right balance. Moreover, we inhabit a world in which computers track every stroke, a “forward” option beckons in each email, and high-res cameras peek from pockets with high speed connections eager to dispatch. But human dignity is sacred, and a vital element of human dignity is respect for the privacy of ourselves and others. When are we to broach an opinion and when ought we keep silent? What should we share and what should we retain? How are we to act when we require information—perhaps to protect human dignity—but recognize that obtaining it conflicts with the same? Should a mother share private information about her teenage daughter with a neighbor in the hopes of getting her help? May I share information about a third party that is indispensable for my friend’s life choices? In today’s society, it is natural to be concerned for the rights of a consumer, and less in vogue to worry about the interests of the vendor. In reality, however, good and evil is done by all of us. Because so much of society focuses on consumer rights, too often, customers are consumed (excuse the pun) by a sense of entitlement and fail to think about the ethics of their actions. This lesson will explore ethical issues that may arise while shopping: Is bargain hunting ethical and compatible with the Jewish value system? Is it a subtle form of taking advantage? What if the consumer understands that the vendor is unaware of the merchandise’s true value? Is it ethical to take advantage of a vendor’s liberal return policies? Is window shopping an unfair exploitation of a vendor? Judaism has much to teach society about our trips to the shopping mall and even our purchases from Zappos.com. All men are not created equal—monetarily, that is. For a host of reasons, some controllable, others not, some human beings are financially better off than their fellows. One of the ways we narrow the divide is through charity, which has always been a quintessential Jewish value. It is well established that Jews give to charitable causes in remarkably lopsided numbers in comparison to the general population. The uniqueness of Judaism, however, lies not only in its emphasis on the deed of charity, but also in its fascinating perspective on philanthropy. According to Jewish thought, charity is as much for the benefit of the benefactor as it is for the recipient. This lesson explores the unique Jewish philosophical angle on charity and how that plays out in real life. Our parents provide us with life as well as a model for human relations. Thus, the Torah demands that we shower our parents with honor and respect. Living in the “sandwich generation,” however, forces us to probe the parameters of our moral obligation to our parents? How are we to react to the prospect of aging parents who devour our time, savings, and energy? Do we have an obligation to take our parents into our homes or pay for their care and medications? Are we expected to sacrifice ourselves for an abusive parent? Does welcoming a parent into our home triumph our marital stability? Understanding the unique Torah perspective on the why of honoring parents will provide much-needed clarity on howto go about doing so. Is wealth to be sought, or is a life of austerity and “happiness with one’s lot” the Jewish ideal? Work, in the Jewish view, is not ancillary to our mission in this world. G‑d could have showered us with wealth and made work superfluous, but He specifically chose to make it a necessity. But how do we—particularly as women—balance work with family, religion, and other important areas of life? This lesson provides a spiritual perspective on work and wealth and why it is such a central focus of our lives, and also seeks to find a healthy balance between work and the other important callings of our lives. In recent decades, many social causes have gained widespread popularity. Among them are: A strong commitment to individual rights and employee rights, a just but compassionate criminal justice system, and a mandate to proactively aid the disadvantaged and oppressed. How is the Jewish version of tikun olam any different from secular social activism? What are our responsibilities as Jews vis-à-vis another’s welfare, safety, property, and dignity? And a question we all struggle with: Considering my limited time and resources, how do I prioritize between all these (and other) important causes? This lesson continues where the last lesson left off. Our responsibilities don’t end with our responsibilities to our fellow Jews and human beings. Other Torah values include: Animal welfare, and concern for the conservation of wildlife, natural resources and habitats, and the environment. This lesson explores social justice issues such as tzaar baalei chayin and bal tashchis. Are we obliged to ensure that the items we purchase were not produced under sweatshop conditions and were not manufactured in plants that wreak havoc on the environment? The lesson (and course) concludes with a discussion about our nation’s spiritual mission vis-à-vis society. In addition to the social responsibilities, we are charged to be “a light unto the nations.” This lesson contains a discussion about the sheva mitzvos bnei Noach.